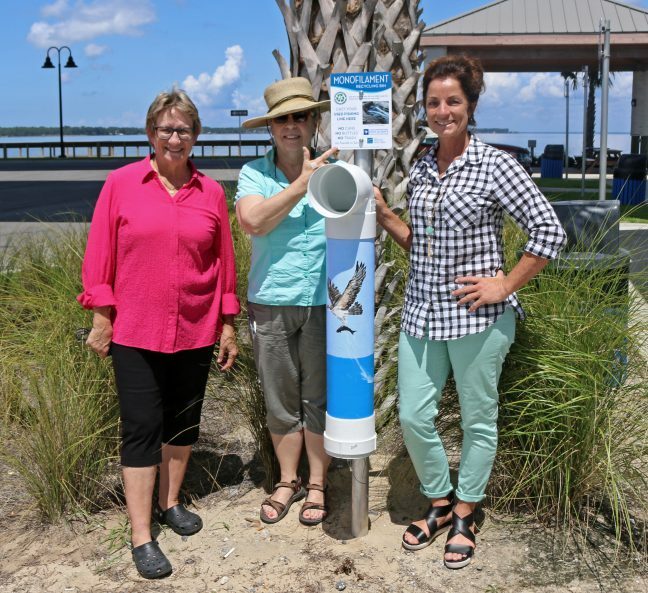 The Choctawatchee Basin Alliance has joined forces with a local artist and an outdoor advocate to remove harmful plastic fishing line, also known as monofilament, along our coast. CBA worked with local artist Joan Vienot and Walton Outdoor publisher Lori Ceier to decorate three new PVC pipe receptacles in Thomas Pilcher and Cessna Parks, complete with drawings of a wildlife. The bins are equipped with an opening for monofilament disposal, which is eventually collected by CBA staff and volunteers for recycling. Vienot and Ceier reminisce about the outflow of debris that riddles beaches, shorelines, and some of the most prominent fishing areas. Not only do the plastic strands entangle marine mammals and aquatic species, but they also are harmful to humans. Fishing line recycler installed at Thomas Pilcher Park. “My favorite part was the design, I think we both enjoyed that. The birds we choose are native to the area. There are a cormorant, Great Blue Heron, and Osprey,” explains Ceier. The monofilament recycling program has grown since its founding during CBA’S Earth Day celebration in 2014. The program strives to reduce the amount of the flexible plastic – mainly used for fishing – and commonly found near the shoreline. Angling line poses a threat to humans, birds, and land mammals, resulting in entanglement that can inevitably lead to death. Unfortunately, fishing line is created from slow degrading plastic that takes over 600 years to break down.